You should take a closer look at this. These days, the Opera team released the browser’s new version called Opera Reborn. The most important new addition is the integration of the popular messengers WhatsApp, Facebook Messenger, and Telegram. Opera is known for being more innovative than other browser developers in many cases, yet being unable to establish themselves on the mass market. The Norwegian page viewer’s market shares are marginal. Now, the team seems to want to end this situation by all means. That’s at least how I interpret the integration of today’s most popular messengers into the browser’s user interface. Overall, the design of the new Reborn browser is very reminiscent of the design for mobile devices. A sidebar, which hides the mentioned messengers, can be found on the left window border. This concept was first introduced by Opera a few months ago, in their experimental browser Neon. The animated transitions are another feature that was transferred over from Neon to Reborn. 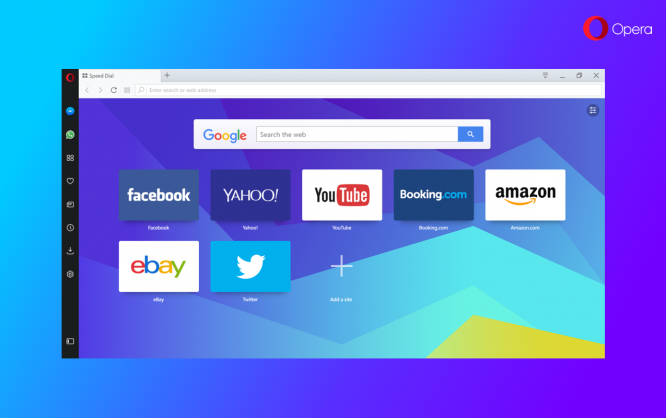 Aside from that, Opera is still based on Chromium, currently in version 58. If you want to inform yourself of the technological changes, I recommend reading this article over at Opera. For designers and developers, visual renovations, which are a major part of the new release, are of minor significance. Here, you only need to be informed regarding the rendering engine at hand, which is Chromium. Thus, the design for Opera is not exotic anymore. For the average surfer, these changes are a lot more attractive, and that is Opera’s actual target audience. The integration of the most popular messengers is already done using the vertical sidebar, where each messenger receives its own icon. This icon changes when the user receives a message. Additionally, you can apparently activate desktop notifications. Of course, the so-called integration is nothing more than the integration of the respective web apps via a separate pictogram that is opened within an own window. Basically, this can also be done with any other browser. The big differences are that Reborn has an own icon that signalizes when the user receives messages and that the actual chat windows can be placed above or next to the currently opened browser window. This way, you get to surf through the web while always having access to your chat account on the left of the visited site. The messenger windows can also be fixed, guaranteeing that you’ll always have an eye on them without your surf experience being affected. To do that, you should own an accordingly large screen, though. Another significant change was made regarding the integrated ad blocker. For one, it also works on the page that you activated it on, even when you’re already on the site. The ad blocker initiates a reload automatically. Secondly, you have more influence on the block lists, allowing you to turn them on or off, as well as maintain your own. For me, all other changes go into the category eye candy, even though Opera would rather put them into the category usability. However, they are overlooking the fact that animations and a few line icons don’t equal improved usability and not even an improved UX. It’s best to take a look for yourself. Opera Reborn is available for free download for Windows, macOS, and Linux.